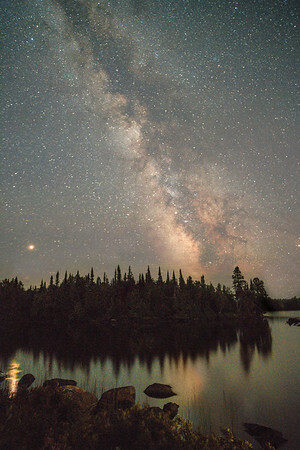 In far northern Minnesota along the Gunflint Trail near the Canadian border, the skies are very dark. To the south where you will find the Milky Way later in the summer, there are no cities producing any light pollution for hundreds of miles. That direction takes you across Lake Superior and much of northern and central Wisconsin, where there are only small towns. Night sky photos, like any photo are best when there is a good composition. In this case, I was very pleased with it.